Transline is the industry leader and direct source for custom coin packaging. Call or click to learn more about how we can help! Transline Wholesale Coin Supply. Your Coin Supply Distributor! 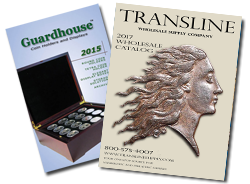 Transline offers a massive selection of in-stock coin collecting books and supplies at the most competitive wholesale prices. Learn more About Us. We do not sell retail. As a coin supply distributor our customers include coin companies, coin shops, book stores, hobby shops and other resellers. Our mission is to carry the widest line of proven products at the most competitive prices. In-stock products you need, prompt shipping and friendly knowledgeable service - because our first priority and only business is keeping you well stocked. To order from this site, you must have a Username and Password.